Power Chiyoga - Holistic Nutritionist MSc. 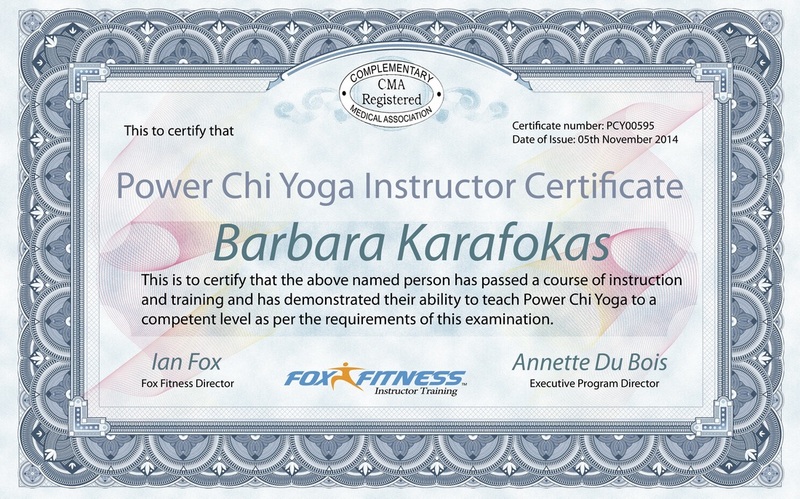 Power Chiyoga is a workout which combines Tai Chi and Yoga. 'Power Chiyoga' is the ultimate stress buster ! 90% of people who visit their doctor suffer from symptoms associated with a stressful life. 'Power Chiyoga' has an holistic approach to health and well-being. With its unique postures, breathing exercises and motivational advice, it offers you an effective solution to tension and stress and is the ultimate preventative exercise form. As such, it is becoming more and more popular with the corporate world as an effective solution to 'executive burnout'. Get Fit and Energised, no matter what your age: Power Chiyoga relaxes your body and your mind and hence enables you to store and release more internal energy and arrest energy wastage caused by stress. It also improves flexibility, fitness and strength, gently and easily without vigorous training. Balance your Mind and your Emotions: Power Chiyoga not only assist you in the mastery of your body but also has a profound effect on your mind through its philosophy and motivational guidance. Combine it with any other sport or activity: Power Chiyoga is effective in combination with competitive sports as it improves and enhances your physical health and strengthens your will-power. Channels your Energy, Creates Poise, Balance, Clarity of Mind and Body Control: Power Chiyoga channels the body's energy for greater strength and stamina. Helps relieve muscle tension to increase flexibility and body mobility. It shapes and defines every major muscle group - legs, buttocks, torso, shoulders and arms. Injuries: If you have any existing injuries, please consult a medical practitioner familiar with yoga. Many old injuries will not hinder your practice at all, and may even be relieved by it. Ilness: Many illnesses can be helped through Power Chiyoga. If you have any of the following conditions be sure to consult a medical professional before commencing Power Chiyoga: This is not because in the case of such conditions, Power Chiyoga is contraindicated. Rather that with direct guidance it can be extremely beneficial. Eating: Please practise on an empty stomach. Allow three hours after a meal, one hour after a very slight snack. Coffee or black tea just before practise can disturb the stomach and nerves. Milk will dull your sensitivity. Herbal tea is ideal. Clothing: Wear comfortable cotton, stretch clothing that do not restrict movement. Avoid tight waistbands, heavy materials and wear no jewellery. Emotional Detox: When you go deep enough into the physical patterns of your body, you will uncover underlying emotional blocks. In doing so you will disturb them: dislodge them from their nests. You then have the opportunity to resolve and release them. This may especially happen when you are sitting still, or lying, where emotional release will surface. Allow it to do so. Do not fight it. Be present and allow it to resolve itself in the light of your awareness. These feeling can include anger, grief, lust, shame, regret, fear, anxiety, sorrow, despair etc. Physical Detox: Power Chiyoga can also precipitate physical discharge. This is part of its purifying, detoxifying effect. Do not be alarmed if you find skin eruptions, rashes, diarrhea, ear or nose discharge, following your session. This is simply a sign of an imbalanced diet / lifestyle now being compensated for in your practise. If it persists consult someone with training in the natural care of the body as part of the mind / body continum. Thursday: 6.30 - 7.30 p.m.
Times and days can be flexible and changed to suit the group. A lunch time session can be added if enough people are interested. Please call 99 682327 and let me know which day / class you would like to join or if another day would suit you.